Moose Jaw residents are no strangers to snow – in fact, they go waaay back. Just because slippery surfaces and buried walkways are familiar, does not mean that you are stuck with them! It can be tough to manage exterior spaces through frigid temperatures but you can always have a Gorilla handle it for you. Our Moose Jaw snow clearing and salting services treat homes and workspaces so you don’t have to. Say goodbye to winter woes with a little help from our property maintenance experts. Snow removal is more than a bit of an inconvenience – it is a law! You might not recognize that even a minor piling of snow can lead to a by-law infraction and fine. What is only a short stroll through a walkway can be a major issue for public servants or those with disabilities. Local businesses are constantly trying to create inviting environments for their clients and snow doesn’t help! While snow might be difficult to wade through, ice can mean bodily harm. Sprains, strains and fractures are a nearly daily occurrence throughout the Moose Jaw area. Property owners have a responsibility to keep ice at bay around their homes or workspaces. Even the smallest patch of ice can mean a big headache, so why not let a Gorilla get rid of it for you? No type of property is safe from snow and ice during the winter season. While bad weather does not discriminate against residential, commercial and multiunit properties, there are specific ways to treat each of these. Instead of letting your winter maintenance and end with a shovel, our Gorillas implement specialty tools to get the best results for any property. Professional snow clearing services do not just stick to one method of removal, but find the one that best suits your space. Levels of snow and ice can change at the drop of a hat. You might spend hours removing snow and ice, only to have your property buried within 48 hours. Don’t bother wasting time with shovels and rock salt only to get subpar results. Our Gorillas are available to commercial, multiunit and residential snow removal services. There is no shortage of property maintenance companies willing to tackle your seasonal needs, so why should you choose a Gorilla? Professional seasonal maintenance looks at that removal equipment that is necessary to get optimal results every time. For example, what works for larger spaces, such as parking lots, will not work for driveways or sidewalks. 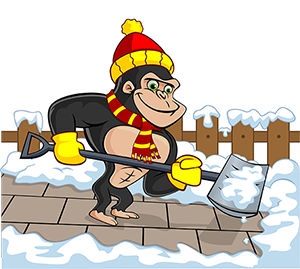 Commercial snow removal is a speciality for our Gorillas, but our services can apply to homes and strata units as well. Shovels might be a traditional technique, but these tools don’t always cut it! Snow plowing is an effective way to handle larger areas, but our Gorillas have snow blowers on hand to accommodate any space. In order to keep up with incoming weather patterns, our Gorillas are always on guard. By monitoring weather networks and incoming storm fronts, our specialists are ready for everything from ice control and a dumping of snow. They say that you can’t put a price on peace of mind but you can with our Gorillas! Because the weather in Moose Jaw can be unpredictable, our services are available for emergency call-outs 24 hours a day. With both reactionary and routine maintenance available, there is never a bad time to call in a Gorilla for your Moose Jaw snow clearing and salting needs.